McCormick Fennel Seed have a sweet, aromatic flavor and aroma that is similar to licorice-like flavor of anise yet less intense. Fennel has a slight menthol undertone along with musty/green flavor notes. The fennel seeds are oval in shape, green or yellowish-brown in color. The fennel seeds comes from the dried, ripe fruit of the perennial Foeniculum vulgare. There are several variations of the Foeniculum vulgare family; the spice Fennel Seed comes from the sweet, or garden, fennel. Some cooks feel that fennel seeds have a natural affinity with fish. Other uses of fennel are in pickling, salad dressings, fish, egg dishes, breads, seafood salads, stews, vegetables, cheese dishes, baked or stewed apples, marinades, boiling shellfish, sautéed mushrooms, cakes, cookies, sausages, and oyster dishes. 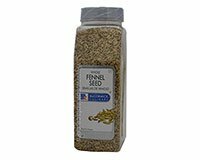 Fennel Seed is an important seasoning used in Italian, the Mediterranean, Chinese, and Scandinavian cuisines.